Ahem... A while ago I put up a challenge for my 50th birthday coming in the year 2012. At the time, I had just started painting with oil and was intrigued with the "painting a day" idea. I thought I would challenge myself to paint 50 paintings. Well, I have decided to revise that challenge! I picked the number 50 for obvious reasons. I actually could paint 50 quick paintings but I want them to be paintings that not only have meaning to me but represent my best effort at the time. At this stage in my development, I don't have the speed and skill to paint 50 with that criteria in mind. I have decided that painting my best is more important to me than painting 50 paintings. I don't regret throwing that number out there though! I am still thinking that I would like to have a showing of some sort but I believe I will make it local and invite my artist friends to participate. I would also like to have a portion of the proceeds go to a worthy organization such as our local United Paws of Tillamook. I am thinking over if I want to add a number of paintings to the challenge. I could do 5 paintings, one for each decade. Perhaps I will just not focus on a certain number but focus instead on joyful meaningful work. I must admit I like that better. Any thoughts? This is my first formal painting of the sea. I am still learning how to paint the ocean and I am fascinated with it. 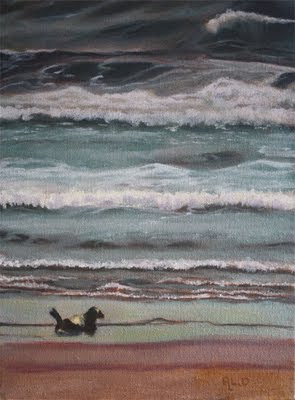 I used my own photo reference to paint the newborn seal and an oil sketch I did that day as a reference for the waves and color. I was glad I did the grisaille first as I would have been lost without the tones already mapped out. I am pleased with the learning experience I had from painting this piece. Life drawing yesterday was quite interesting. I am still processing the recent workshop I attended. I definitely see its influence in my work. I would like to take a moment to thank all of you who commented on my recent posts during the workshop. I am going to try to update the Blogger and see if that will allow me to comment on my own posts again! Love your seascape. 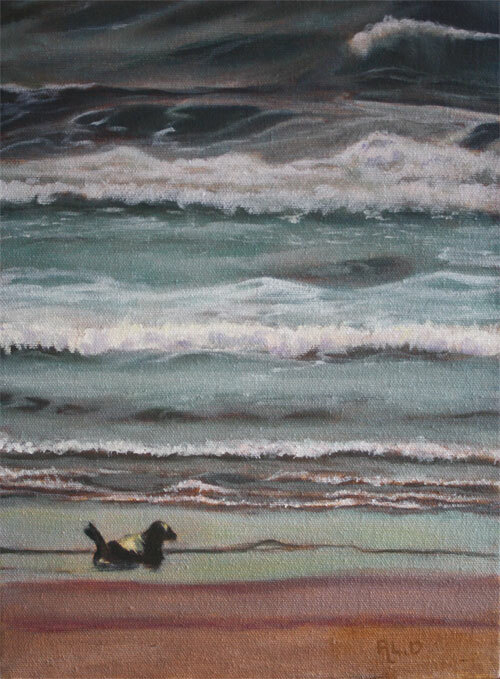 There's a sense of foreboding in the scene; the sea is so stormy and the little seal so vulnerable. As far as the 50 paintings/daily paintings idea, here are my thoughts. There is great value in working every day, which the daily paintings encourage. And there is value in quick sketches and paintings, which could provide the seeds of new paintings and ideas. BUT, if your goal is to be a better painter, then I agree that working on a painting for many days has some overriding benefits. Working a painting helps me to really learn from my mistakes, learn to analyze my work, learn how to correct errors and hopefully, get better. There's a freedom in dashing out a painting, but it rarely ends up saying what I intend. Like you, I am not very fast, and ending up with a painting that communicates what I'm trying to say, is more important than a huge body of mediocre ones. I'm following your process with interest!